amanda mcclements & metrocurean: Last Chance To Win Ben's Chili Bowl Book! 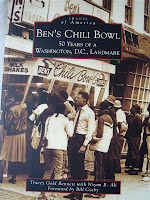 Last Chance To Win Ben's Chili Bowl Book! Only five more hours to enter to win "Ben's Chili Bowl: 50 Years of a Washington, D.C., Landmark" in honor of the big 5oth anniversary tomorrow! Post your comments here for a chance to win. I'll announce the five lucky winners tomorrow afternoon. Mmmm...Chili Cheese fries for breakfast.